Adios, Lazy Days of Summer! Now is the time for all summery goodies to rock your stamping table! No summertime stamps? Let your project take us away on a splendid summer vacation in any way you wish! Well, it might not be a vacation, but to me roses represent Summer! And my favourite roses are a combination of yellow and pink. You may have noticed that I really love the Timeless Elegance DSP! It's so versatile and so easy to dress up - just add a little colour. 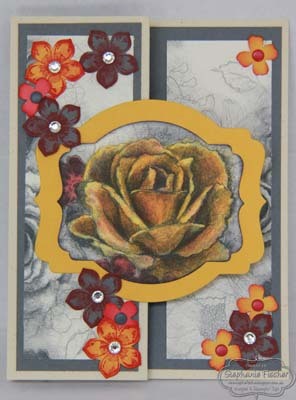 Here I watercoloured one of the rose images and cut it out with the Deco Labels framelits and edged it with black ink. I layered this onto Crushed Curry, which I cut with the next size up of framelit. 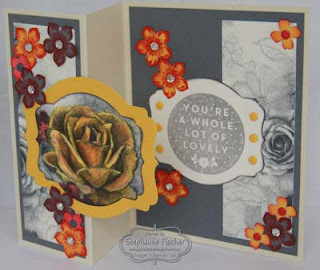 I stamped with a Petite Petals stamp onto Crushed Curry and Basic Grey with Watermelon Wonder and punched them out with the matching Petite Petals punch. Then I punched little flowers from Crushed Curry, Watermelon Wonder and Basic Grey with the Itty Bitty Accents punch. The centres of the flowers are a combination of Candy Dots and Rhinestone Basic Jewels. 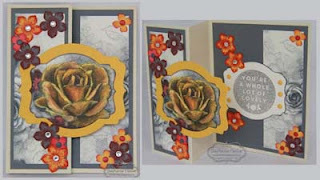 The fold is a Z-fold from Naturals Ivory card stock (I missed it's retirement - sorry. However, Very Vanilla would do the trick) which I layered with Basic Grey and Timeless Elegance DSP. I used the smaller of the two framelits to cut another label in Very Vanilla. I stamped the circular image from A Whole Lot of Lovely in the middle, edged it with black ink and added some Crushed Curry Candy Dots. Then I stuck this to the inside part of the card so that, when the card is closed, it is hidden by the yellow label on the top of the card. Then I liberally sprinkled my card with the little flowers to end up with a summer garden. 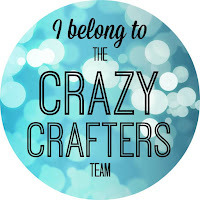 Join in the fun at Splitcoaststampers.